At Blandford Nature Center, we strive to have every child experience nature and wildlife in a fun, hands-on way! Thanks to the Grand Rapids Student Advancement Foundation, we are able to provide outdoor science-based education programs to all GRPS first and third grade students. To schedule a field trip, email the Registrar at registrar@blandfordnaturecenter.org with program choice, two preferred dates/times, and student count and we’ll schedule you soon. 2018-2019 GRPS PRIORITY REGISTRATION IS CLOSED! How do organisms survive in their environment? Students will learn that animal adaptations, whether it’s an unique trait or survival strategy, play a critical role in an animal’s outcome in life. A focus on seed movement has students exploring fields and woods and uncovering secrets of plant and animal interdependence. Investigate the Blandford Farm using your five senses! See plants growing, hear pollinators buzzing, smell nectar-rich flowers, taste vegetables, and get hands-on experience as you and your students experience the day in the life of a farmer. A lively puppet show begins our exciting exploration of maple syrup production. Investigate the entire sugaring process through stories, activities, and a short hike to the Sugarhouse to understand how human interaction and the use of natural resources affect the environment. Anishinabek Lifeways 2 hrs. Offered in the AM only. Travel back 400-500 years ago to the time of early Native Americans and reflect on how the seasons and resources of Michigan influenced the lives of the Anishinabe people using hands-on experiences with traditional tools. Statement: Use historical thinking to understand the past. Young biologists explore two different Michigan ecosystems, searching for evidence of biodiverse food chains within the unique habitats. Program will finish with an up close view of Blandford’s Wildlife Ambassadors. Learn about vertebrate groups, their unique qualities and habits. Live animals and hands-on props highlight adaptations the different vertebrates use for protections, warmth and food gathering. Snowy Survivors 1.5 hrs. Add snowshoes for a special 2 hr. AM only experience! Discover the secrets of animal survival during the winter and how animal characteristics and adaptations help them survive during this cold and snowy season. Program is 1.5 hrs. without snowshoes; 2 hours with snowshoes. Snowshoe availability is dependent on amount of snowfall. Experience the science of maple syrup production. Identify maples, collect data on forest health and smell the sweet syrup cooking in the Sugarhouse. Practice modern methods of tapping, collection and boiling using real tools, then taste the sweet results. Once you have these 3 choices made, click on the correct button below to complete your request. Once your request has been submitted, it will be processed within 2 weeks. You will receive an email confirmation with date, time, and program details. What makes a trip to Blandford special? 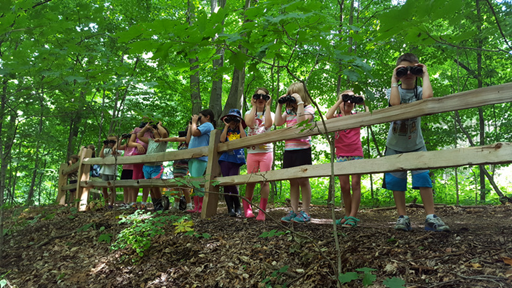 Blandford Nature Center field trips allow your students to answer Big Questions in a hands-on, natural environment. BNC field trips are aligned with Next Generation Science Standards so students not only learn about a particular subject matter, but they learn about its interactions with the rest of their world. Research is clear that time spent in nature helps children develop better cognitive abilities and critical-thinking skills and equips them with the passion and knowledge to care about their environment. How do I set up a field trip? Please keep in mind that we have a 60 student-per-program maximum. If you’d like to bring additional students, we can frequently accommodate either by: 1) scheduling multiple days; or 2) by arranging for half of your group to take a self-guided tour while the other half takes a guided program and then flip-flopping. To get a full list of programs, visit our website by clicking here. Please note, most programs are 90 minutes and have a $5 per student fee. Please allow for two weeks’ response time to your request, particularly in early Fall & around Sugarbush in March. What can I expect on the day of our trip? Blandford programs ask big questions for hands-on exploration. Anticipate that your students will spend most of their 90 minutes outside in the elements. Please make sure they are prepared with weather-appropriate clothing and closed-toed shoes that can get muddy. When you arrive, your bus should park in the designated bus parking beside the depots on the east side of the parking lot. Your Blandford Educators will meet you at the bus and lead you to your program. If you come in cars, your Educators will meet you in front of the Mary Jane Dockeray Visitor Center. If you arrive significantly before your program begins, we recommend taking your students on the Wildlife Trail that wraps around the north side of the Visitor Center. Please do not bring groups of students into the Visitor Center except in situations of inclement weather. Weather Cancellation: If the National Weather Service issues a severe weather warning we will cancel the program; there is no fee for cancelling due to severe weather. We will attempt to reschedule based on availability. If your school calls a snow day, there is no fee for cancelling. If you choose not to attend your program due to weather, but a severe warning is not issued and your school has not called a snow day, you will be subject to the cancellation fee if we are unable to reschedule your field trip. All Other Cancellations: For all non-weather cancellations, notice must be sent to the Registrar at registrar@blandfordnaturecenter.org and received at least 21 business days before the scheduled program to receive a full refund and avoid a $50.00 cancellation fee. This policy does not apply to cases of inclement weather or programs that are rescheduled (based on availability). Attendance Refunds: Refunds will be issued if more than 5 students are missing from the program date. Refunds will have a 5% handling fee. Please plan to bring one chaperone for every five students. If you bring more chaperones, we will charge $5 / chaperone in excess of your 1:5 ratio. Please give us advance notice if you’ll be bringing more than 3 extra chaperones. What can my chaperones expect? Your chaperones will all be included in your group’s introduction, then will break up into groups and follow educators for the remainder of the program. We have laminated information sheets available for chaperones to read during the introduction. Chaperones are requested to model appropriate behavior (listening to the educator, not pulling students aside for photos or having side conversations while the educator is teaching), to assist the educator with any materials if asked (handing out clipboards or trail sheets), and in rare cases, assist the educator with behavior management (buddying up with an energetic student and helping to ensure the group stays together). Please inform your chaperones of their roles and responsibilities prior to arriving at the program. We charge $5/student with a program minimum of $80. Why do we need to pre-pay? As soon as we send your confirmation, we reserve educators to teach your program and those educators are made unavailable for other programs. Your pre-payment allows us to accurately schedule out our staff to ensure that all schools have the educators they need for their programs and ensures our educators are compensated for their prep time. If you bring at least five fewer students than anticipated, we will offer a refund minus a 5% processing fee. We appreciate your understanding. Yes! We offer scholarships to schools where at least 85% of the students qualify for Free or Reduced Lunch. The per pupil cost is reduced from $5 to $3; please inquire with the Registrar when you register to see if you qualify for a scholarship. What happens if our day-of numbers are different than expected? If your group brings at least five students fewer than expected, we will refund you the cost of those absent students, minus a 5% processing fee. If between scheduling and paying your invoice your student count changes, please send an email to registrar@blandfordnaturecenter.org and we will update your invoice. We will do our best to accommodate your group if you are running late. Please call us at (616) 735-6240 as soon as you know you’ll be late, and prior to arrival discuss with your transportation whether you will be able to depart late from BNC. Depending on BNC’s schedule and your transportation needs, we will set a new schedule for your visit. Though we will do our best to accommodate, a tardy arrival will likely result in a shortened program. Can members of my group use their BNC membership to pay for their program? Blandford memberships are intended for family visits and cannot be applied to field trips. Can we eat lunch at Blandford? Yes! When you make your reservation, please let us know that you’ll be eating lunch while on the property. Lunches can be eaten in the schoolyard or at the farm: a limited number of picnic tables are available at both locations. In the case of inclement weather, we will try to accommodate, but cannot guarantee, an inside space for your group. We do not have refrigeration facilities for lunches, so please bring coolers for any lunches that may need them. Can I extend my Blandford experience? Yes! There are many ways to extend your time here at BNC. • Following your program, you can lead your group on a self-guided hike – we’ll provide you with trail maps and hike sheets and you can stay as long as you’d like. • You can do two programs on a single day: we recommend doing a morning program followed by lunch, and then an afternoon program. Any of our programs can be combined in this way (season permitting). • Many of our programs have additional content stations that we can add to your experience. Our Anishinabek Lifeways program can be extended into a full-day experience; Pioneer Life can be extended by 30 minutes; and Snowy Survivors can be extended by 30 minutes to include a free snowshoe hike. My question isn't listed here, who should I contact? Please call our Visitor Services staff at (616) 735-6240 for any other questions.